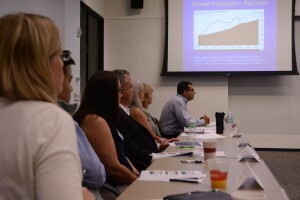 On May 25, the Credit Interchange Division’s Operating Committee hosted a roundtable, Navigating a Credit Department Through Industry Transition, focused on training and determining a credit department’s relevancy through a transitioning industry. Entry-level and experienced credit professionals discussed market projections and how to determine when to take legal action with attorney Carl Doré of Carl Doré Law Group. Committee Chairman Randy Friedsam, Director, Credit and Collections, Select Energy Services, kicked off the meeting by asking attendees to introduce themselves, noting the informal, open dialogue format of the event and encouraging Q&A. Building on the topics covered at the PESA Annual Meeting – Navigating a Market in Transition held in April, Friedsam and Doré discussed how credit departments are especially critical during a downturn and the need to communicate that message internally. As companies make cuts across the board, understanding how to determine credit worthiness with new and existing customers is crucial. “Credit departments add exponential value to a company and PESA’s CID division further increases that value. Credit professionals are responsible for understanding their value, effectively communicating it across all levels of management and advocating on their own behalf,” stated Doré. Doré discussed how sales and marketing departments tend to base decisions on relationships rather than payment history. Establishing trustworthy relationships with customers should play a key role in determining credit worthiness, however, payment statistics must also be considered. While sales and marketing departments strongly advocate for or against working with certain vendors, Doré said that credit departments do not actively share their knowledge on the advantages or disadvantages of particular customers. “Focus on finding where your goals, your customers’ goals and your management’s goals all intersect. Companies should focus on collaboration throughout all departments to reach shared goals,” stated Doré. As the market evolves, credit departments must realign their goals with updated, proactive strategies to collect on payments. Doré recommends starting the process early and sending the demand letter with proper language including trapping language and allegation of the Prompt Pay Act. He urges credit professionals to be well informed and to know how to ask the correct questions regarding lien laws. Liens should include non-operating working interest owners and ensure valid real property descriptions. Additionally, companies should utilize their legal departments to expedite the process. Developing a plan and possessing a clear understanding of how and when to incorporate legal action helps companies throughout the collections process. As oilfield credit professionals develop plans for the transitioning market, CID creates unique opportunities for members to network and discuss best practices. The next CID event is the CID Annual Meeting on October 18-20 at DistributionNOW. For more information on attending CID events or becoming a member please contact cid@pesa.org.